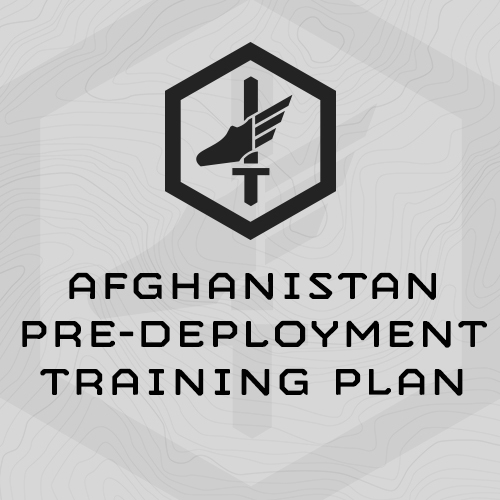 We designed this 6-week training plan mission-specifically to build the legs and lungs for soldiers and others need to patrol in the mountainous regions of Afghanistan. Over a dozen US Army and Marine Corps Battalions plus thousands of individual US and NATO soldiers used this program prior to deployment downrange. This plan has also been used by mountaineers training for trips to the Himalaya, and backcountry big game hunters planning bow hunting and other trips in the West and Alaska. "I've had great success with all of your programming I've tried, starting back more than handful of years ago with your Afghanistan prep plan before my first deployment. I ran the Virtue Series Packet throughout my most recent deployment last year, and left in some of the best shape I've been in a long while. I've got an older version of the APFT plan and have used it several times over the years with solid success, and I always recommend it to soldiers in my unit struggling with their scores- I've seen it turn a couple guys careers around at the last minute. It's amazing what working up to a decent PT score can do for a soldiers morale. I'm a big fan of your programming and the methodology/mindset behind it. Keep up the incredible work!"